Buy fresh fruit in season and you can’t go wrong, right? Apples are in season in the U.S., on sale and super delicious. So buying a big bag of organic apples was a must on my to-do list. While I love biting into a simple apple, sometimes I just need a little spice in my life. Don’t we all? So, here’s an easy and healthy way to enjoy a traditional dessert without the fat, sugar or starch. In a 9 x 13 baking pan, combine apples, lemon juice and cinnamon. Mix well and set aside. In a food processor with bottom blade, combine walnuts, dates, cinnamon and vanilla. Blend until all ingredients are mixed and walnuts are chopped fine. 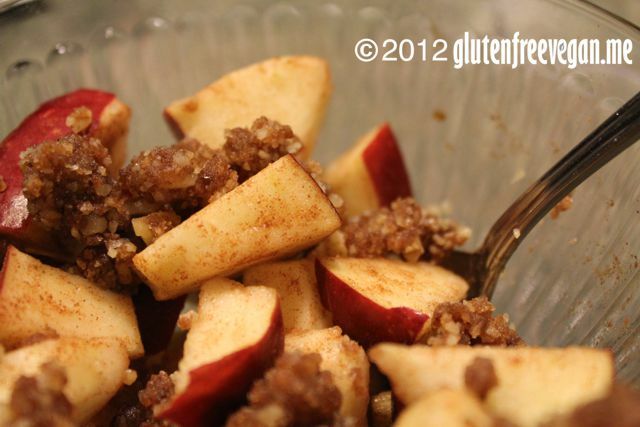 Crumble topping on top of apples and serve. Makes 8 – 12 servings. This recipe goes great with a little vegan vanilla yogurt or vegan ice cream. Also, you can make the topping and refrigerate, using only what you need if you prefer to make smaller servings of apples. This entry was posted in desserts, Recipes and tagged apples, cinnamon, fall recipe, fruit, gluten-free, glutenfreevegan.me, glutenfreeveganme.com, healthy, nuts, raw, raw vegan, recipe, spice, vegan, vegan cooking, vegan recipes. Bookmark the permalink.